According to Panasonic, the Lumix DMC-GX1’s 15.8-million-pixel sensor has a 200% improved signal-to-noise ratio when compared to the older 12.1-million-pixel sensor found in the GF1. The first indication that noise control has been improved is through the extended sensitivity range of ISO 160-12,800. As I would expect, our resolution charts indicate that the GX1 resolves the same level of detail as the G3, reaching the 26 marker at ISO 160 in raw format. Where the GX1 sensor scores over the G3 is that resolution detail remains high all the way to ISO 6400, reaching the 22 marker. 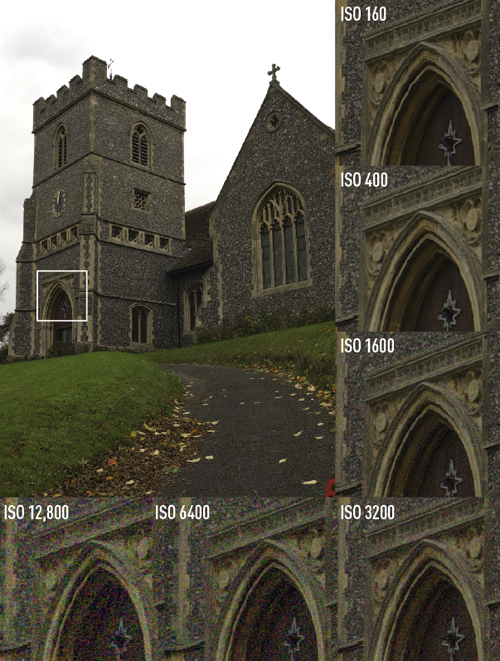 The ISO 12,800 setting sees a significant drop in resolved detail as luminance and chroma noise are evident, so this setting should only be used as a last resort. Resolution detail is good and is the most important end result. However, on the first signs of luminance noise at ISO 800 clarity is compromised, and significantly so at ISO 3200. To compensate, in-camera sharpening and noise reduction are applied, which makes for mushier image detail. Overall, these results mark a genuine improvement over previous Panasonic models, although the GX1 still has a little way to go to match the results from cameras with larger sensors. 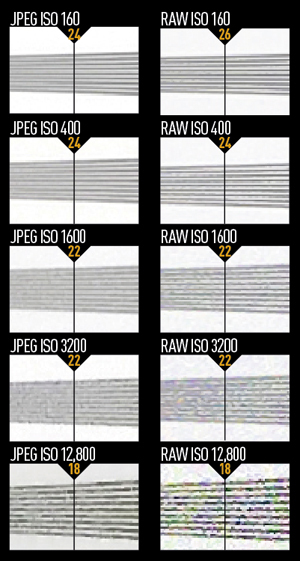 Resolution charts: These images show 72ppi (100% on a computer screen) sections of images of a resolution chart, captured at f/5.6 and the 60mm setting of the ‘X’ kit lens. We show the section of the resolution chart where the camera starts to fail to reproduce the lines separately. The higher the number visible in these images, the better the camera’s detail resolution is at the specified sensitivity setting.